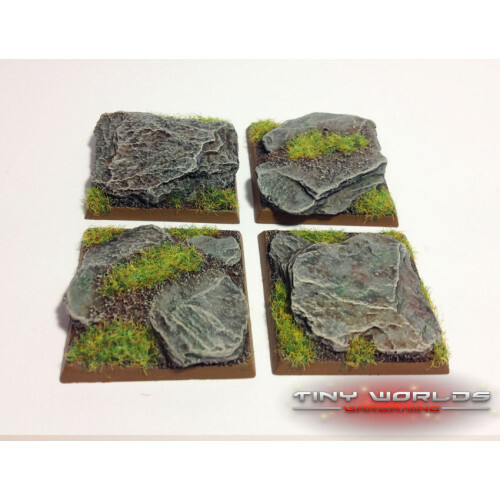 Set of 4 highly detailed 40mm square figure bases ideal for a number of fantasy wargames. These impressive bases display a sculpted slate/rock surface and are great for introducing that extra level of detail to your wargames miniatures, rapidly and without difficulty. Manufactured from a resilient cast polyurethane resin, these bases are sold unpainted and without flocking. Painted samples shown to define detail and show the achievable appearance. The bases are simple to paint with a magnificent level of detail and can be readily mixed with bases provided by most other manufacturers to create a one-of-a-kind army.